Before he left for Brazil, we had asked Evan if he wanted to curl in a bonspiel taking place in the Annapolis Valley this weekend. I was a bit surprised when his response was, ‘But that’s St. Patrick’s Day. Aren’t we doing something?” Our last name, McDonah, is Irish, and D’Arcy’s father’s family came from Killarney, in County Clare, Ireland. Each year, we usually get together with family and friends (and some years, guests!) and host a Guinness inspired meal. I didn’t realize this had become an event the family looks forward to so much. When I asked for menu suggestions, they came up with burgers. “Patties” for St. Paddy’s! We invited my parents and I made lamb burgers and sweet potato buns. They were really good – the recipe came from Canadian Living and can be found by clicking here: Sweet Potato Rolls. We also barbequed potatoes, carrots & onions, and my mom had brought a salad. I cooked mushrooms & red onions in Guinness to top the burgers. For dessert, we had shamrock shaped cookies and mint-chocolate-chip ice cream while watching a slide show of Evan’s photos from Brazil. There was coffee & Bailey’s for the adults. We ended the evening playing a short version of Pictionary. 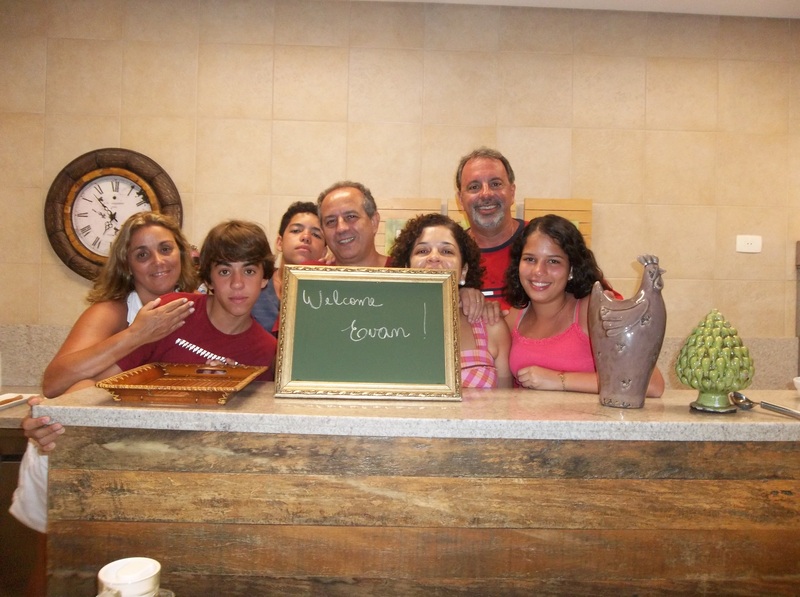 Evan's Brazilian families - we love them! 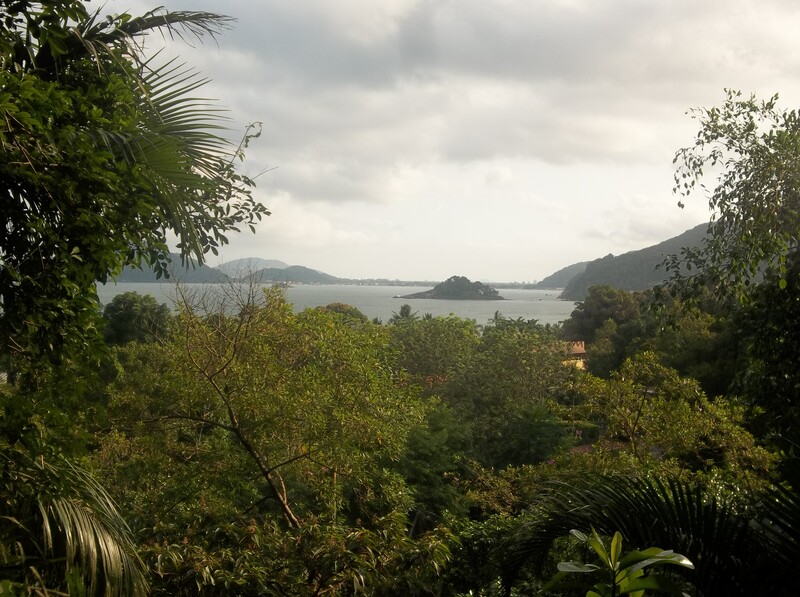 A view of the rain forest, taken from the home of Jean Piaget's Principal's mother. 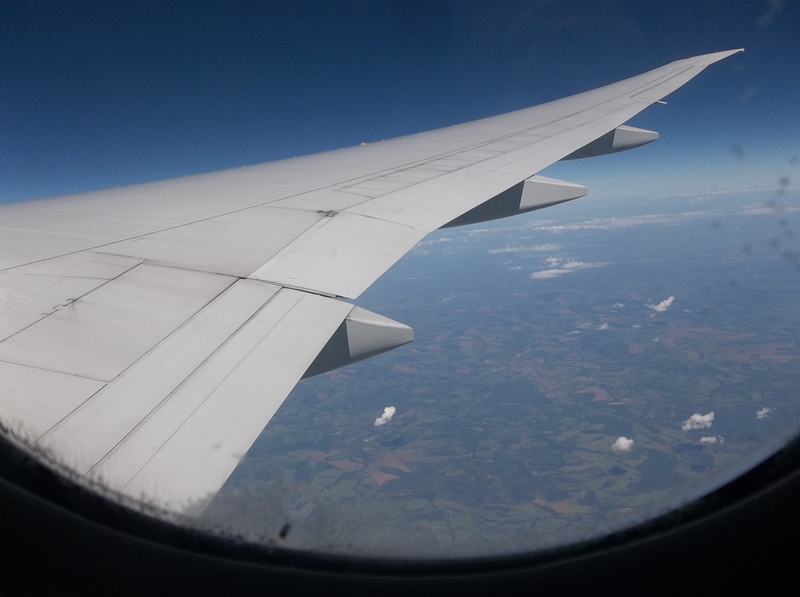 The flight from Sao Paulo had been delayed, causing them to miss their connecting flight from Toronto to Halifax. We had been tracking the flight online and realized that 15 minutes between when their flight landed and their next flight departed would not be enough time to clear customs and get to the next gate. We sat around for a few minutes, figuring someone would contact us, and sure enough, it wasn’t very long before Evan called. Smart kid used our toll-free number… Another benefit of growing up in a B&B! 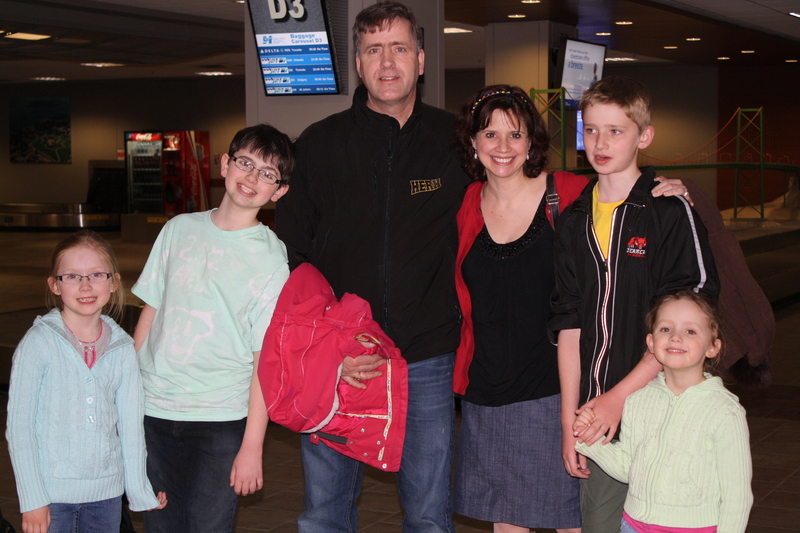 They were booked on another flight, but their new scheduled arrival time was 4:01 p.m. I went to school, Alex went to space camp, and we made plans to leave for the airport shortly after two. 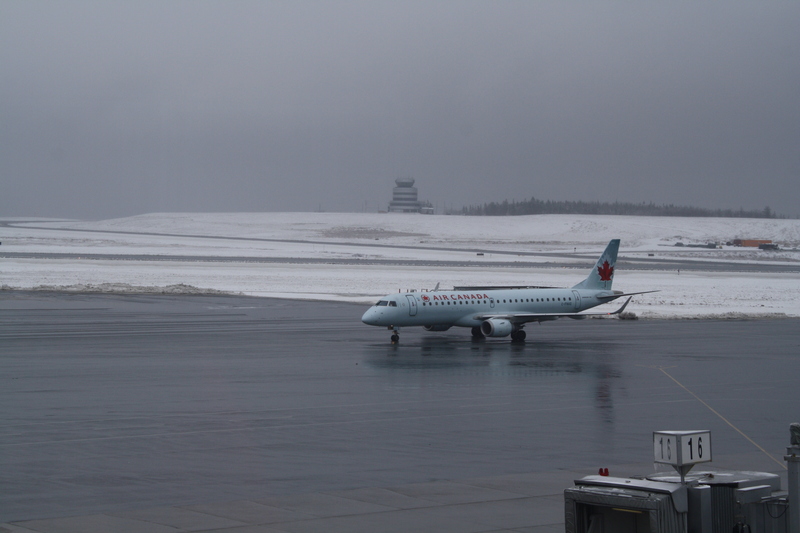 The weather was terrible, so in some ways we were happy to have the delay, so that our trip to Halifax Stanfield Airport wouldn’t be as stressful. We watched the airlines all day and although many flights were delayed because of the snow, his wasn’t. 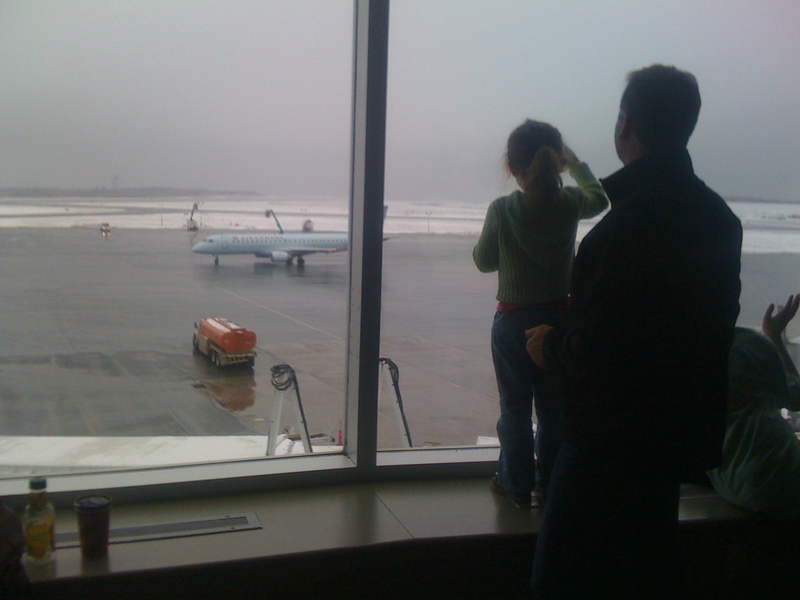 The flight from Toronto to Halifax is only 1h45m, so as soon as we saw that the flight had departed from the gate in Toronto, we began our 45 minute drive to the airport. When we arrived, we met up with my parents, who needed to come and see their grandson for themselves as well! We all went upstairs to the runway observatory and actually watched Evan’s plane land. We all waved frantically, and he admitted on the way home that he saw us! (It helped that his flight’s gate was right under the observatory window!) 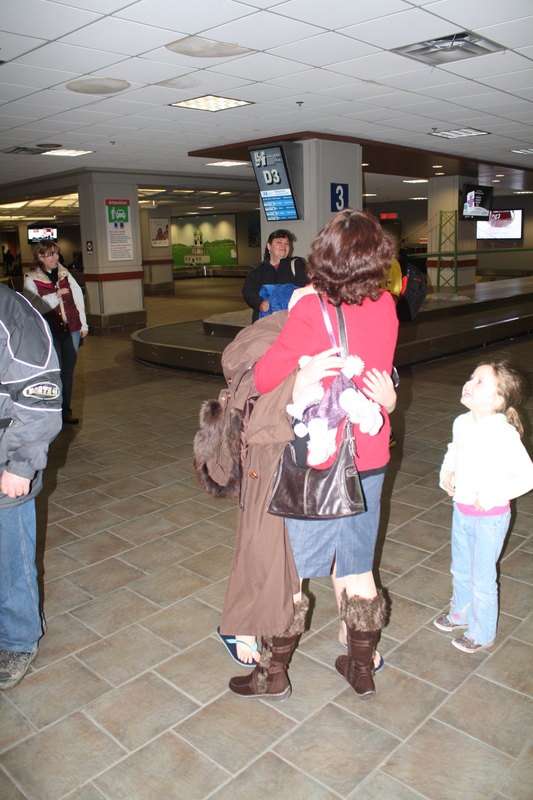 As they were setting up the jetway, we rushed back downstairs to the arrivals area to greet him. 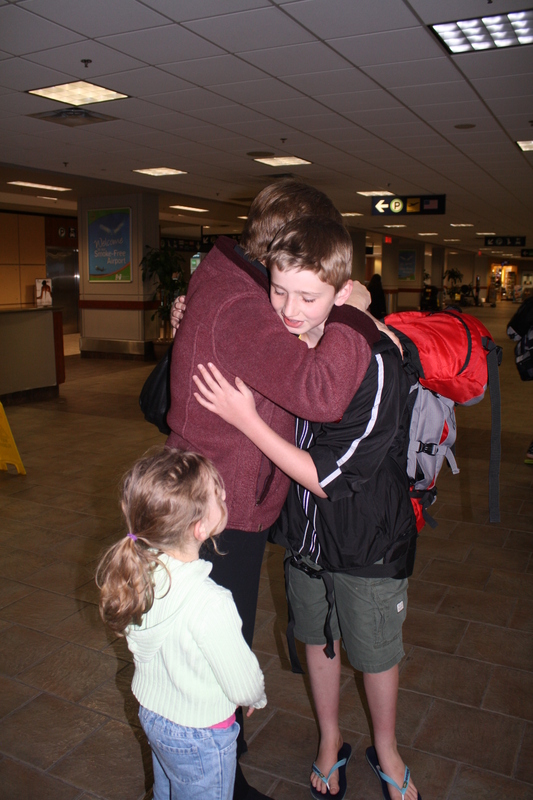 Evan's flight, arriving from Toronto. He's in the window, two ahead of the middle exit door! 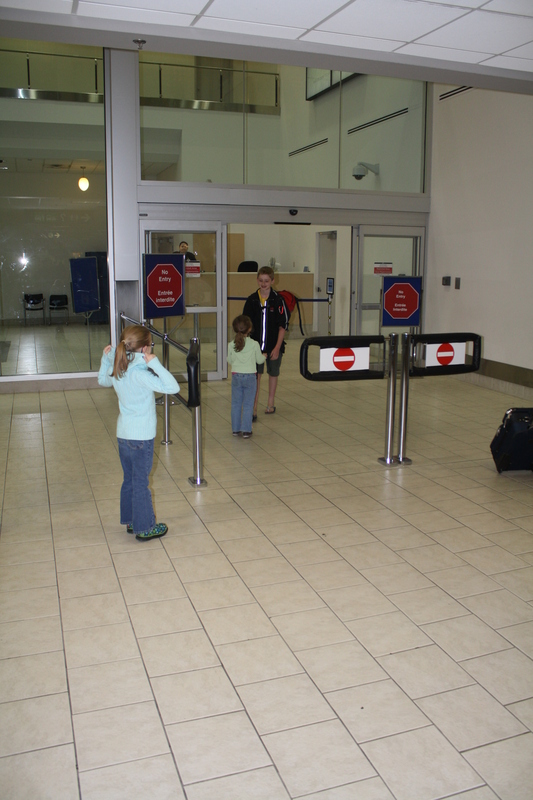 Olivia couldn't help herself, she ran right through the "no entry" signs to greet her biggest brother! Our family is together again! 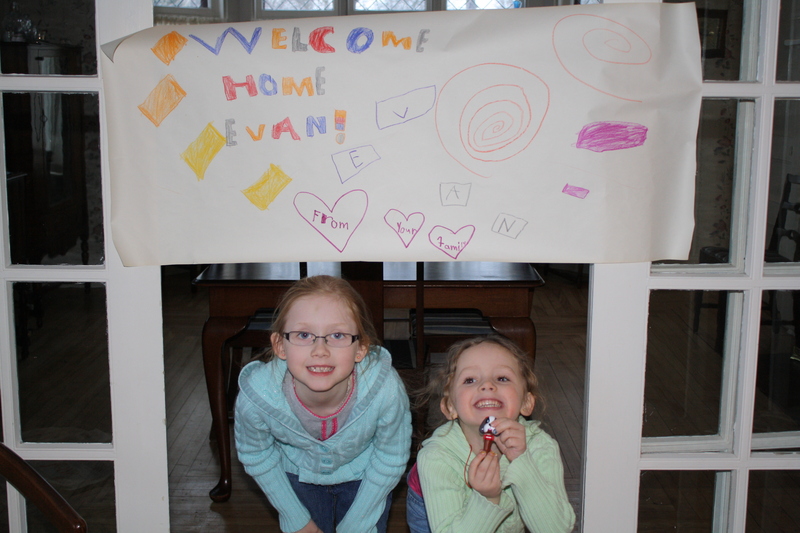 We came home and the girls showed off the sign they had made him. We had a great supper, he gave us thoughtful gifts, and then we downloaded his photos and heard stories. 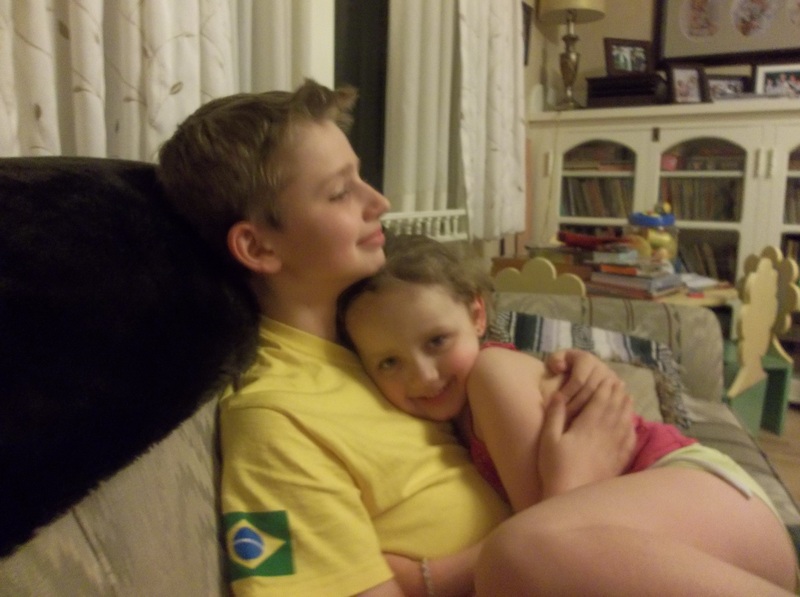 Olivia couldn’t help herself – she arrived back downstairs after bedtime just to make sure that Evan was really home and to have one last snuggle. 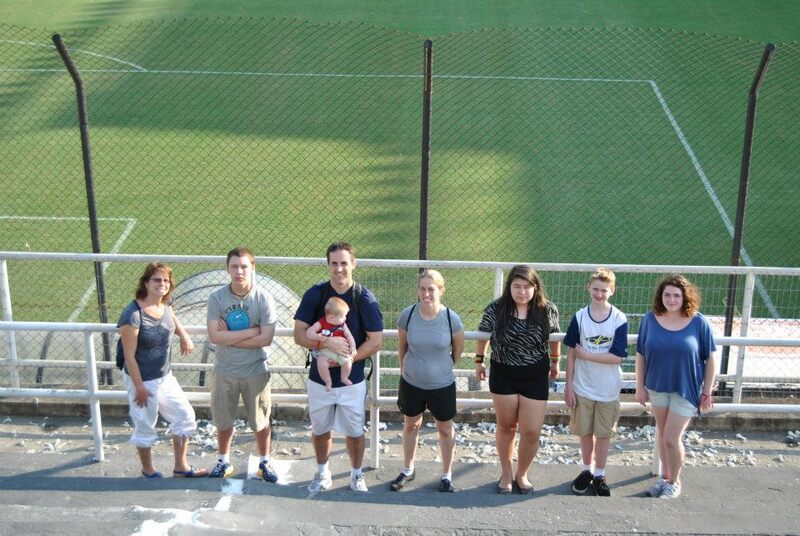 Today is the Canadians’ final morning in Santos. They are grocery shopping, taking a cooking class and having lunch before leaving for the airport at 1:00. The bus ride will take three hours to the Sao Paulo airport and their flight from Sao Paulo to Toronto leaves at 8:20 this evening. We will be tracking it, of course, via flight tracker, and will all be at the airport tomorrow (in the snow!) to greet him! We’ve had wonderful notes from Francisco, both last night and this morning, telling us how much they enjoyed having him and how much they will miss him. “Congratulations for your firstborn, He´s polite, kind and We´re already missing him…My English isn´t enough to express our affection and admiration for him… this morning was terrible to everybody..Lucia cried with a feeling of loss, JVC & BRUNO didn´t want to say goodbye, Bruno was restless since yesterday…We absolutely loved this amazing boy, our Canadian son….Thanks, thanks, thanks…our home is your home…” We felt the same way about their son, JV, and are so blessed to have made this connection between our two families. I have no doubt that this connection is one that will continue forever! “yesterday we made a visit to a daycare along with a few jean piaget students. the children were great and we brought some gifts to give to them all. 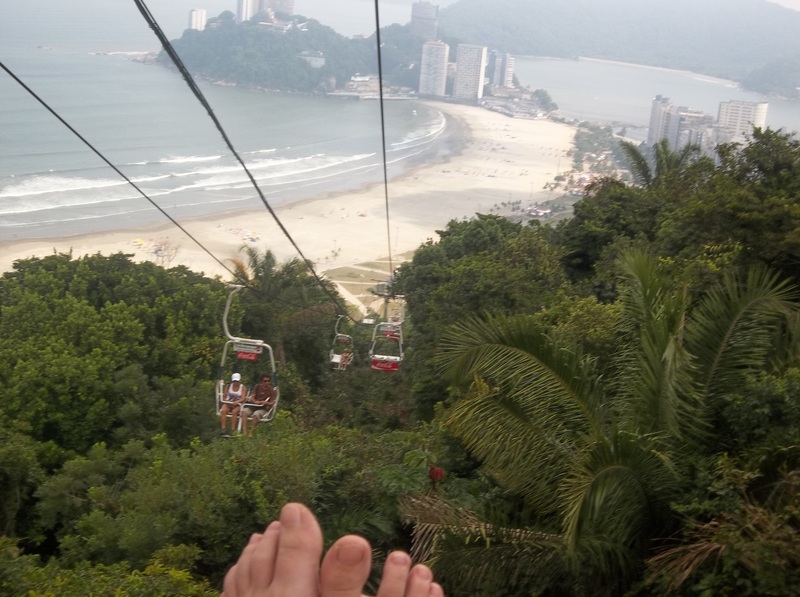 afterwards we took a cable car that took us up a mountain 170 meters tall. we ate lunch at a resteraunt on the top of the mountain and then took the same cable car back down the mountain. when we got back to the school we participated in a english class and then were dismissed. I chatted briefly with Evan yesterday afternoon while he was packing. He wanted to be sure he was packing things in the right places. (Is sunscreen a liquid, etc.) They had a closing celebration at the school and he was able to do some last-minute shopping. He still has some money left and is hoping to be able to purchase a Brazilian flag at the airport. This morning’s email – the final one – was written by Evan. I keep asking him if he’s seen any monkeys and he has replied “only the ones on Skype” (his sisters). Yesterday we planted a tree in the rainforest in the village of Itutinga. And no, there were no monkeys. 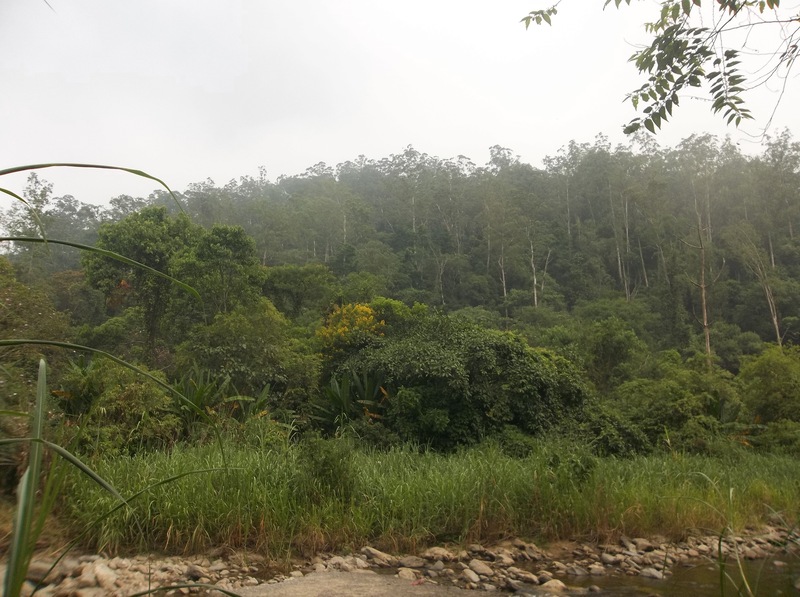 It took a while to do because of the drive, the hike, planting trees, etc. Although it was the first day that we were early. Today we do a cooking class and start our journey home at 1. What an experience this has been for all of us! We are so grateful to Francisco, Lucia, Joao Victor and Bruno for being so kind and loving to our son. 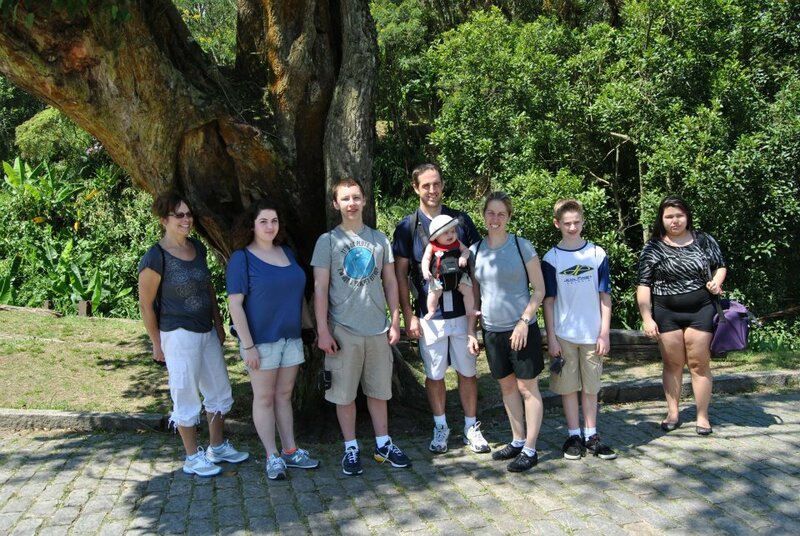 On a school exchange such as this, having a host family who is a great fit makes all the difference! 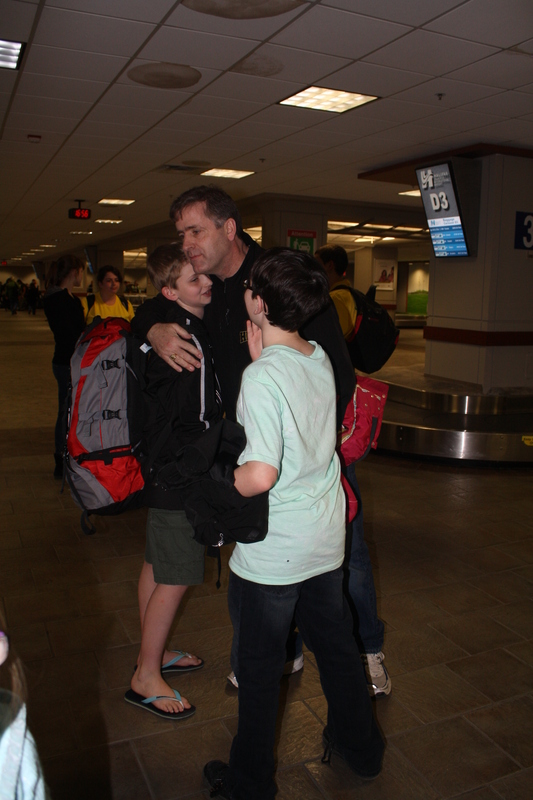 They have been warm and engaged and have treated Evan just like their own son. 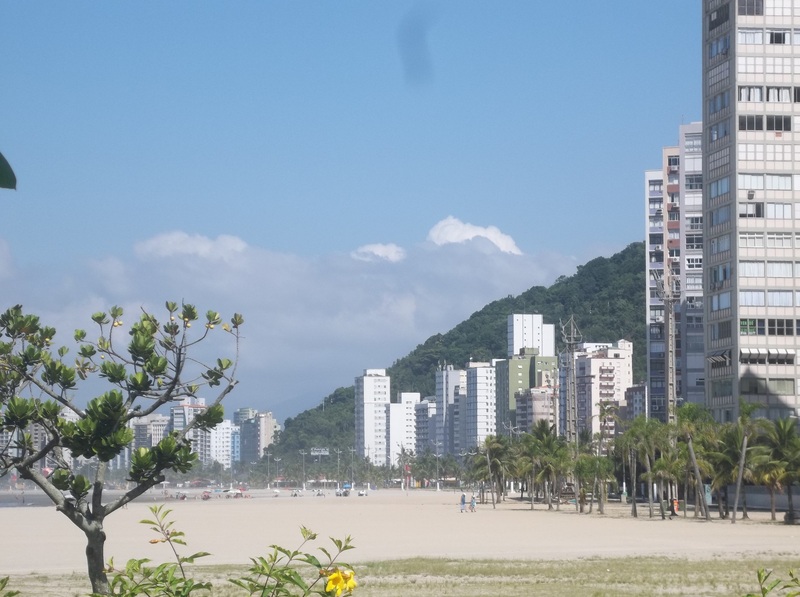 I’m sure that there are many mixed emotions for all of the Canadians as they prepare their final meal together with their Brazilian families: sadness to leave their new friends, the sun, the beaches… but excitement and anticipation for the 22 hour long journey home. I can’t wait to see him! “In the morning we went to a fruit market that was really long there was tons of different fruits you could try and there was also fish, clothes, and other stuff you could buy it was really cool to see all the different fruits they had. 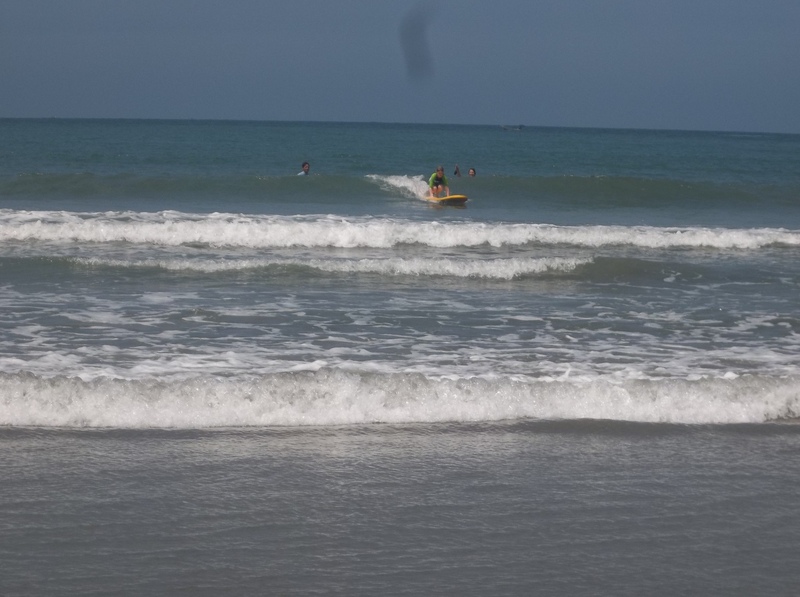 Then we went to a water treatment place it was really gross… Then we went surfing, that was like the best thing ever for that whole day!!! all 4 of us managed to stand up for atleast 25 seconds, after that we had a bbq at alexanders place that was really good also!!! 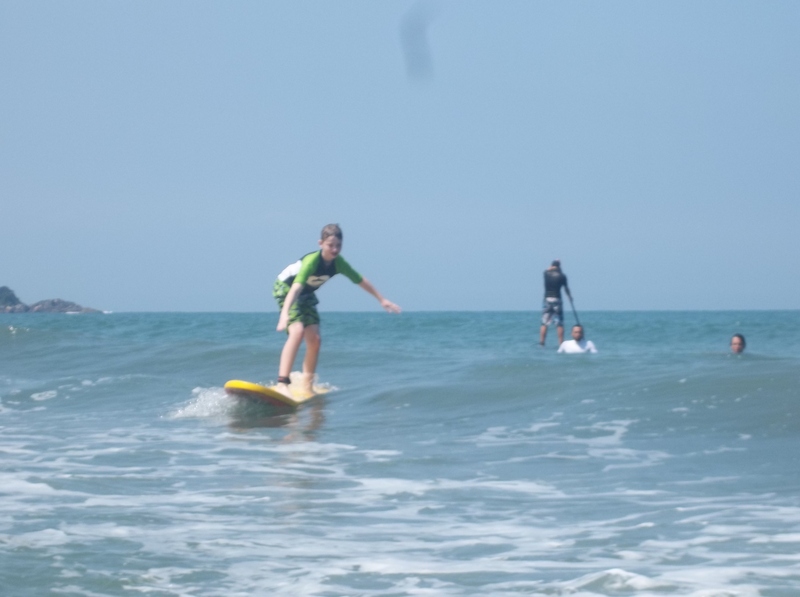 We were able to chat with Evan a couple of times this weekend and he proclaimed that surfing was AWESOME! He even intends to take it up back here in Nova Scotia. We do actually, have beaches in Nova Scotia that are known for their surfing conditions, however the water here is much chillier, I’m sure, than the water in Brazil! Evan continues having a wonderful time! On Saturday, they had gone shopping at a mall, but he thought they were going to the beach, so left his money at home! 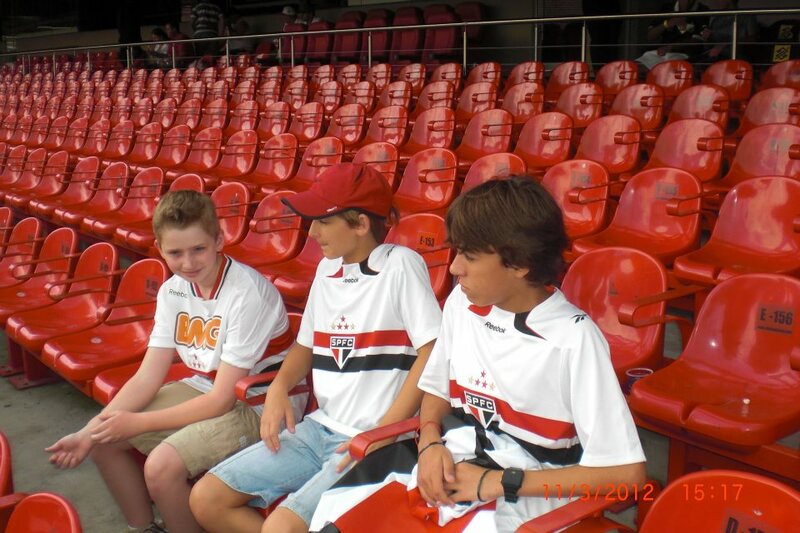 On Sunday, he traveled into Sao Paulo with his host family to see Sao Paulo play Football (Soccer) against the Portuguesa Team. Sao Paulo is the largest city in the Southern Hemisphere, one of the largest cities in the world, with a population of 20,000,000. It’s hard for us to wrap our heads around the size of a city that houses two-thirds of the population of Canada! 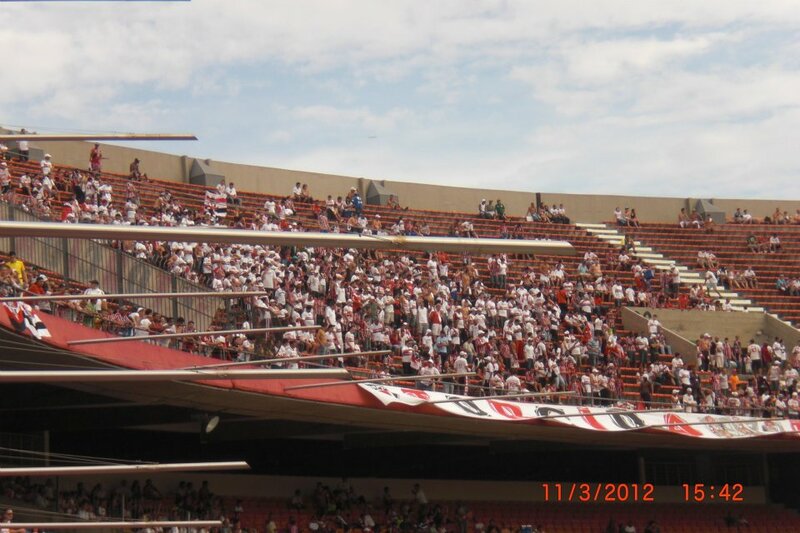 The football stadium itself holds 80,000 people, but there were “only” 18,000 there for yesterday’s game. Evan said it was hot when they first got there, but then there was a rain shower, so they got soaked! 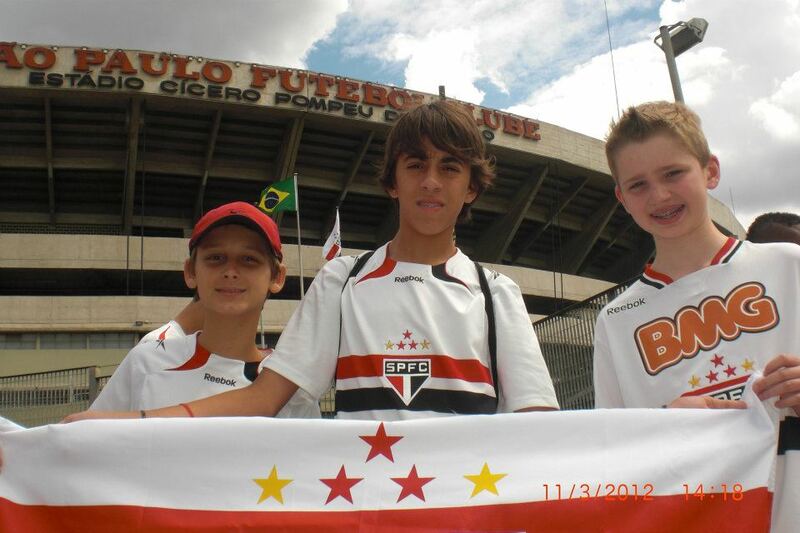 Sao Paulo won the game 2-1. They arrived early and toured the stadium before the game was to begin. 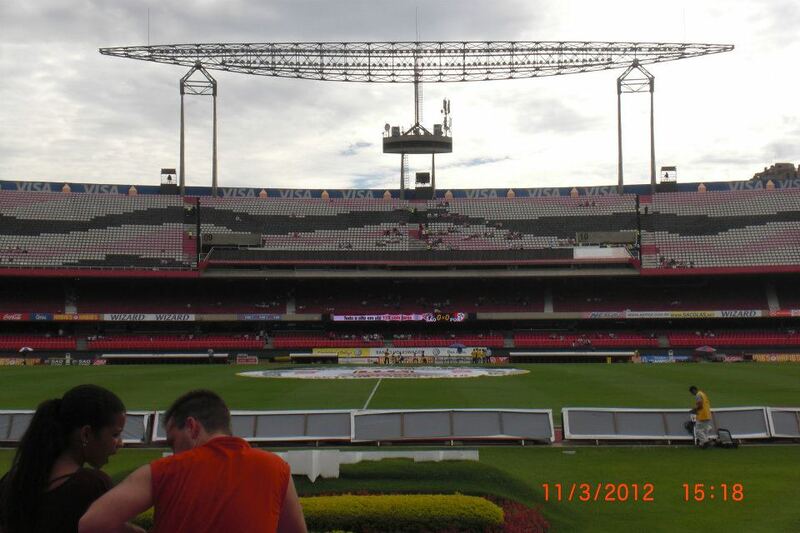 The stadium seats 80,000 people! Fans arriving - only 18,000! 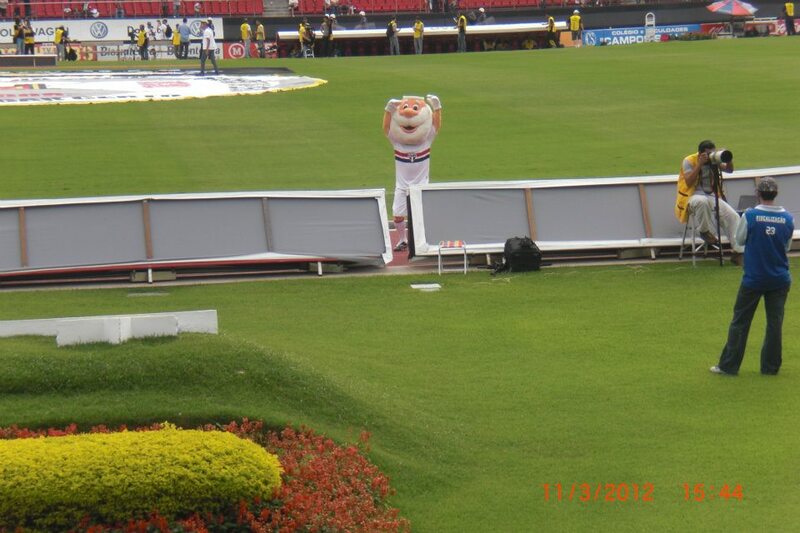 The Sao Paulo team enters the stadium. 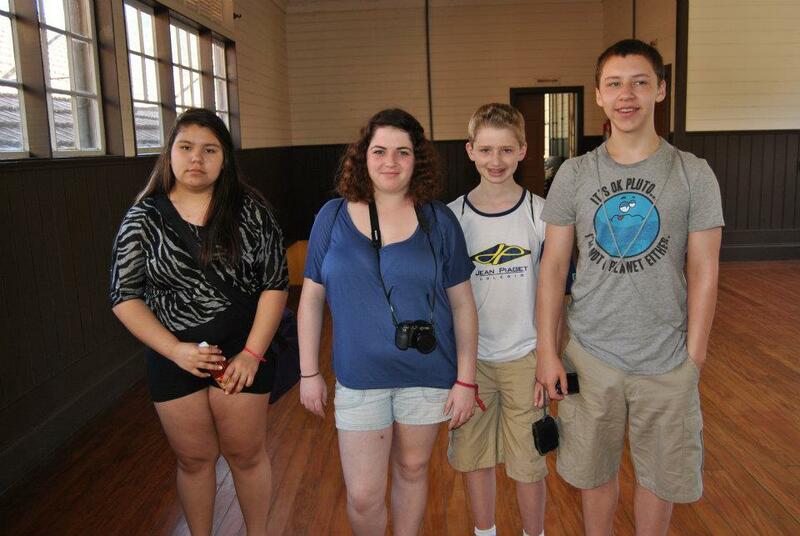 One of the chaperones, Jennifer, posted some photos, which were great to see! 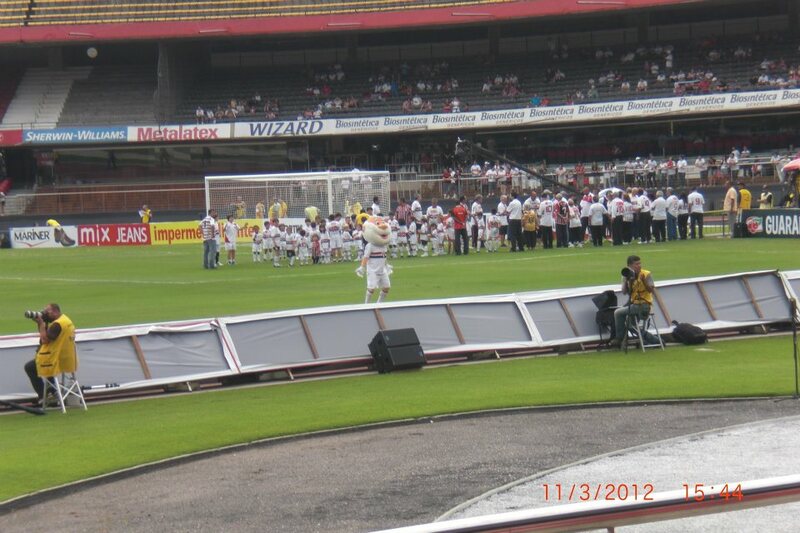 The Canadians at the Santos Football (Soccer) Stadium! I am a happy mother this morning after connecting with Evan in Brazil last night! Oh, the wonders of computer – it’s great to be able to instant message one another! He has reported that he is having a lot of fun, getting used to the heat, and got sunburned despite the 100SPF sunscreen. Last night, they went to Scott’s host family’s home for a pizza party. I asked him what Brazilians use as pizza toppings and he reported that there is “usually lots of olives and cheese”. He was finally able to see the stars (it’s been overcast at night) but has yet to see the Southern Cross. He is enjoying trying new foods and having new experiences. He’s even bought a few souveniers – including some Brazilian coffee for his parents! 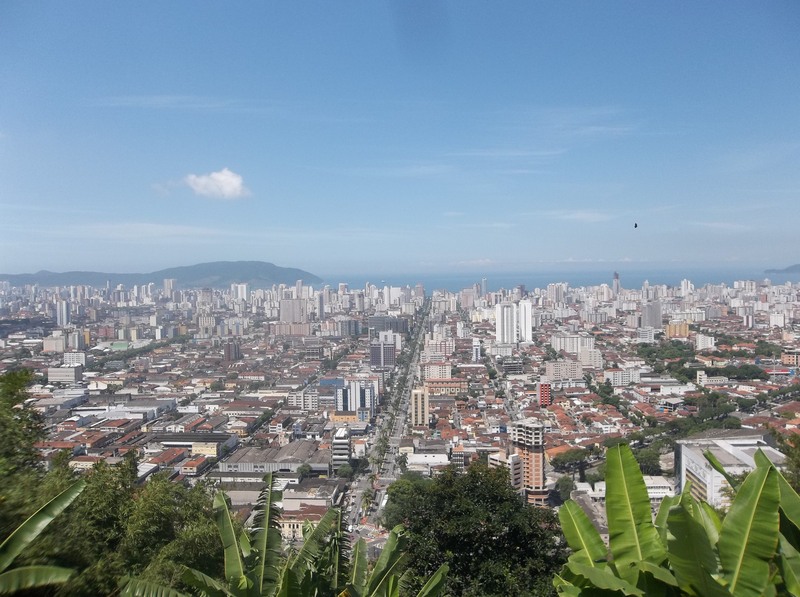 Yesterday we toured downtown Santos. The first thing we did was go to a coffee museum. It was very informative. 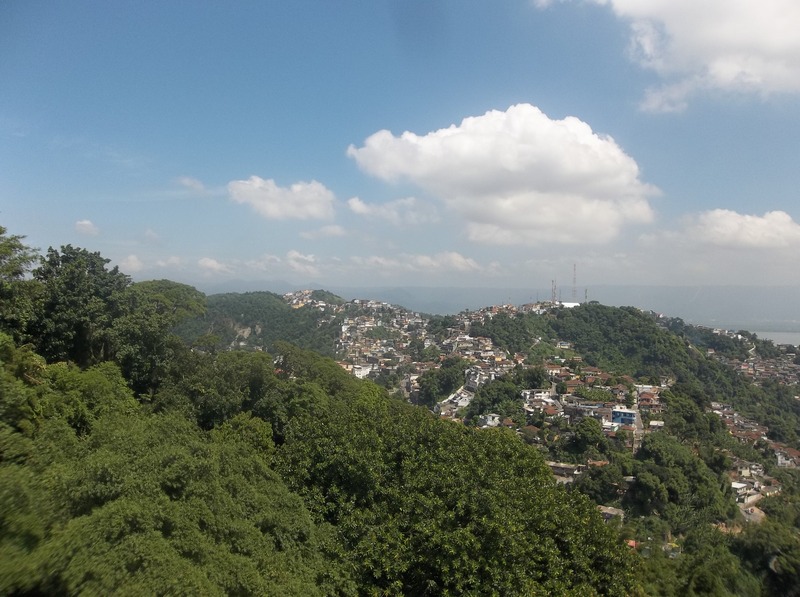 The next thing that we did was go to Monte Serrat. We all went up on the trolley but on the way down Jennifer, Luciana, Scott, Sue and I walked all 402 steps down. We even beat Erin, Irene, Tom and Coen going down on the trolley! While we were up on the hill, it was crazy how high up we were. 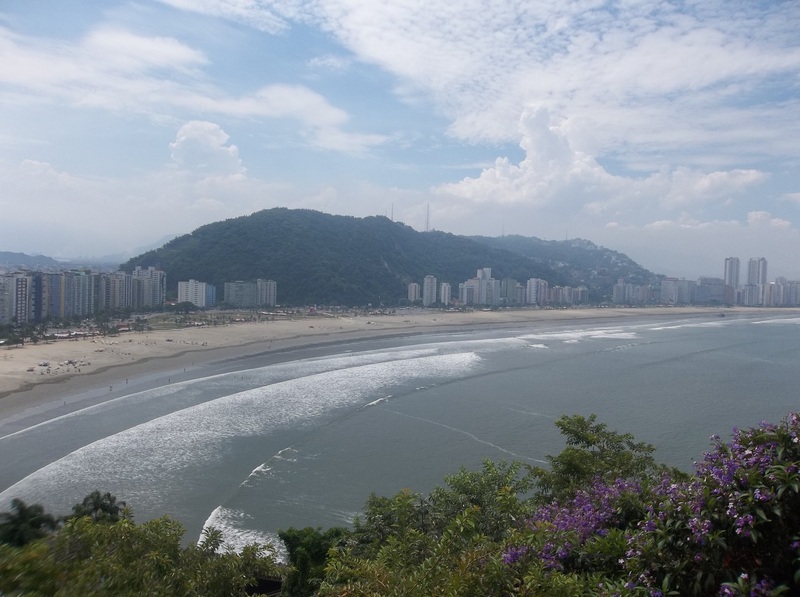 After we finished at Monte Serrat, we had Pastels and fries for lunch at Carioca´s. We went to the oldest house in Santos and saw some cool rooms. 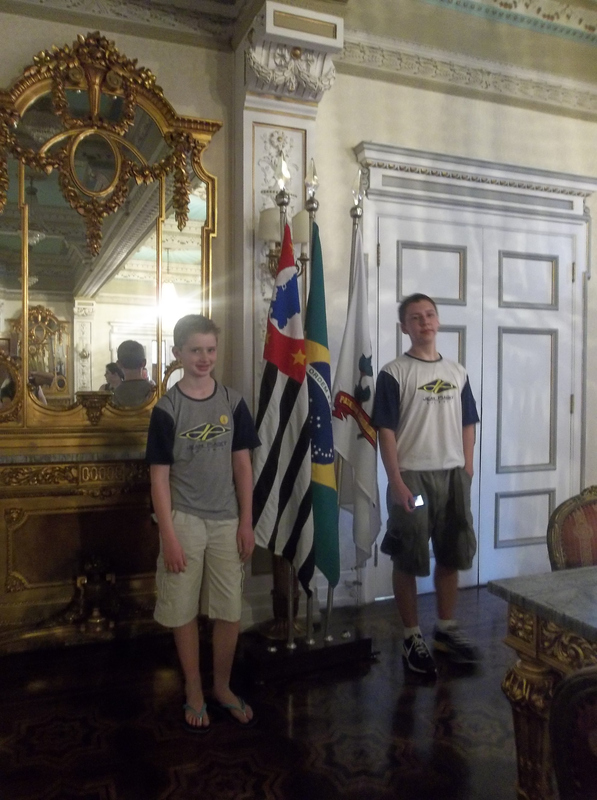 Then we went to City Hall and after we went on a Cable Car tour through Santos. I chatted with Evan briefly via Instant Messaging yesterday afternoon, but we did not get to Skype in the evening. He sounds like he is minding the heat, which we expected could be a problem. (He’s like his father that way!) He had been swimming in the afternoon which he said helped – that, and the fact that the temperature was down to *only* 28*F! 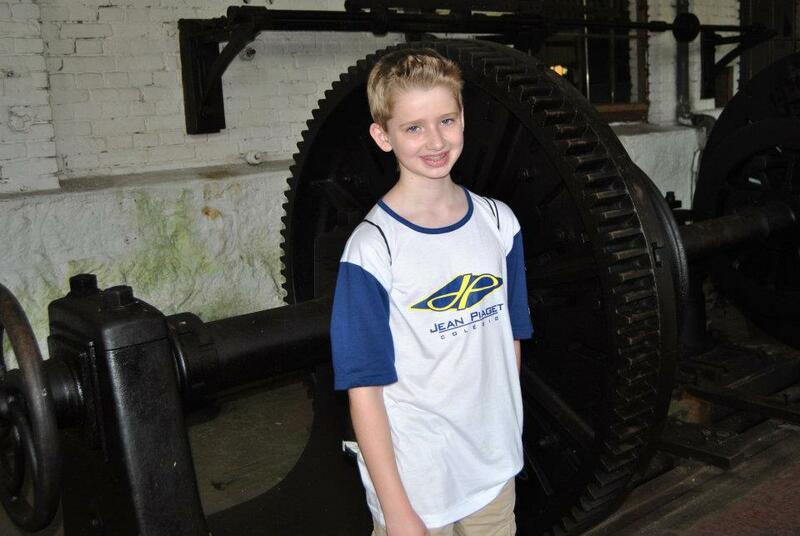 He’s also finding the 7:30 school start time early… Otherwise, he was in good spirits and reports that he’s having fun! 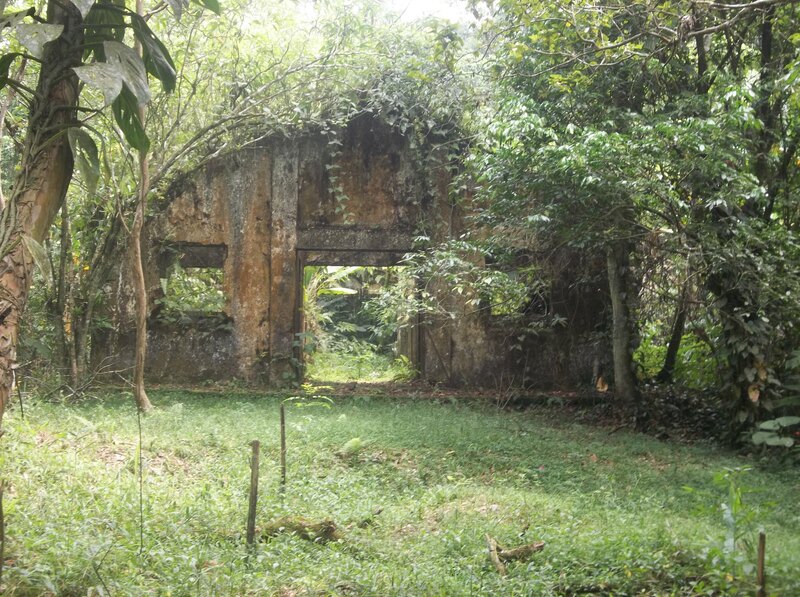 Yesterday’s update from Brazil comes via Erin and, unfortunately, does not include a photo. yesterday we went to a aquarium with like different fish and sea lions and PENGUINS!!!! !, also sea museum with really weird dead fish and sharks and a boat ride around snake island. it was all really fun, we met up with the brazilians and then got on the boat, after a couple minutes when we were behind snakes island we got to jump off the boat and into the water that was like the best part out of everything yesterday for me anyway. i had a lot of fun!! !